A real-time system combining a simulator and a GNSS propagation model reproduces an authentic multipath environment. 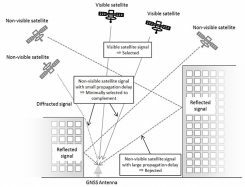 The propagation model relies on a 3D-model reconstruction of the urban environment, which generates a multipath signature strictly dependent on the location of the receiver’s antenna. This yields important results for a moving vehicle, which may be affected by very different multipath conditions depending on trajectory and location. A technique developed by researchers at the University of Illinois at Urbana-Champaign distinguishes a reflected non-line-of-sight (NLOS) signal of a particular satellite from the LOS signal and characterizes the NLOS signal as coming from a virtual mirror-image satellite in the direction of the signal reflection point. By using information on the position and orientation of the reflector, the NLOS signal can be treated as an additional LOS signal. A new solution for GNSS multipath employs a multi-element antenna with RF signal switching and a single front end to reduce complexity, power consumption and cost. Correlator beamforming, initially used in the 2.4 GHz frequency band where it has proven effective at mitigating multipath in heavy industrial environments, has been successfully adapted for GNSS use. A particle-filter-based positioning method using a 3D map to rectify the errors created by multipath and non-line-of-sight signals on the positioning result delivered by a low-cost single-frequency GPS receiver takes a multi-GNSS approach, using the combined signals of GPS, GLONASS and QZSS. The method outperforms conventional positioning in availability and positioning accuracy. It will likely be fused with other sensors in a future pedestrian navigation application.